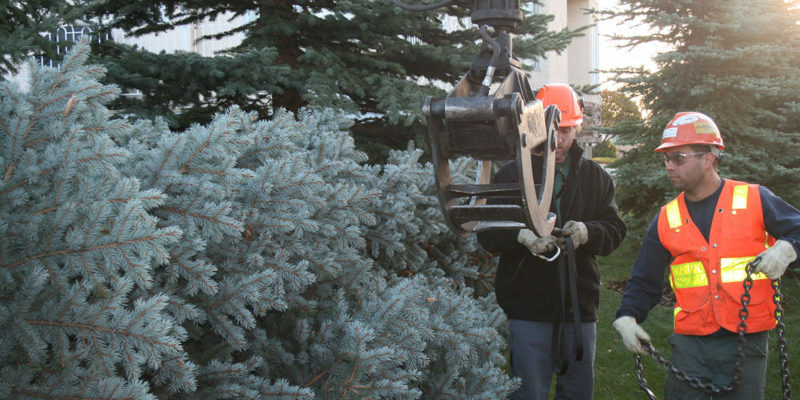 Below, you’ll find a pair of articles written to help our customers in Western Canada as they make decisions about pruning and topping their trees. At ArborCare Tree Service Ltd., we want our customers to have the information they need to make informed choices. Read on to learn more, or contact us for more information. Starvation: Good pruning practices rarely remove more than 1/4 to 1/2 of the crown, which in turn does not seriously interfere with the ability of a tree’s leafy crown to manufacture food. Topping removes so much of the crown that it upsets an older tree’s well-developed crown-to-root ratio and temporarily cuts off its food-making ability. Shock: A tree’s crown is like an umbrella that shields much of the tree from the direct rays of the sun. By suddenly removing this protection, the remaining bark tissue is so exposed that scalding may result. There may also be a dramatic effect on neighbouring trees and shrubs. If these thrive in shade and the shade is removed, poor health or death may result. Insects and Disease: The large stubs of a topped tree have a difficult time forming callus. The terminal location of these cuts, as well as their large diameter, prevent the tree’s chemically based natural defense system from doing its job. The stubs are highly vulnerable to insect invasion and the spores of decay fungi. If decay is already present in the limb, opening the limb will speed the spread of the disease. Weak Limbs: At best, the wood of a new limb that sprouts after a larger limb is truncated is more weakly attached than a limb that develops more normally. If rot exists or develops at the severed end of the limb, the weight of the sprout makes a bad situation even worse. Rapid New Growth: The goal of topping is usually to control the height and spread of a tree. Actually, it has the opposite effect. The resulting sprouts (often called water sprouts) are far more numerous than normal new growth and they elongate so rapidly that the tree returns to its original height in a very short time – and with a far denser crown. Tree Death: Some older trees are more tolerant to topping than others. Beeches, for example, do not sprout readily after severe pruning and the reduced foliage most surely will lead to death of the tree. Ugliness: A topped tree is a disfigured tree. Even with its regrowth it never regains the grace and character of its species. The landscape and the community are robbed of a valuable asset. Cost: To a worker with a saw, topping a tree is much easier than applying the skill and judgement of good pruning. Therefore, topping may cost less in the short run. However, the true costs of topping are hidden. These include: reduced property value, the expense of removal and replacement if the tree dies, the loss of other trees and shrubs if they succumb to changed light conditions, the risk of liability from weakened branches, and increased future maintenance.